CDO – A Temporary Role? Roles emerge within organizations that may exist over several years but will probably not be perennial. Roles concerning the digital transformation of organizations may be such roles. New types of leadership may be fulfilling a momentary need or they may prove necessary over a long period of time. Three examples looked at in The Organization in the Digital Age are: the Chief Digital Officer (CDO) whose role is to accelerate the digital transformation of organizations, the Community Manager who facilitates the work of communities and, last but not least, the internal Change Agent, the activist in the organization who champions new work practices. This post focuses on the CDO. Data from the most recent survey (Q4 of 2014) showed that only 23 organizations out of nearly 300 reported having a Chief Digital Officer (CDO). Interestingly, when further questioned about the scope of the CDO role, it became clear that in a fair number of cases the CDO was not actually at a C-level, that’s to say reporting directly to the CEO or equivalent in the organization. Instead the individual with CDO-like responsibilities reports to the head of another function, usually Marketing or IT, but has been given the assignment of working on digital things. 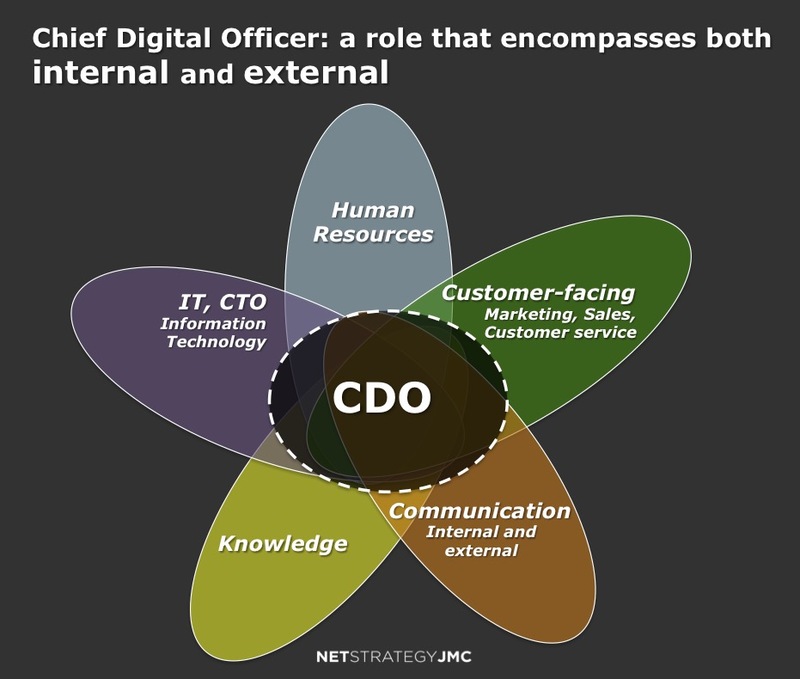 The CDO scope must be internal as much as external. If not, transformation will be superficial. The few organizations that have a true CDO report that the duties cover all or some of the following areas: customer relations, marketing, internal communication, external communication, knowledge management, HR, information management and IT. The CDO role therefore touches on responsibilities that are part of the scope of other functions such as the CIO (Information), CMO (Marketing), CKO (Knowledge) or the heads of the various functional services. Over a third of respondents to the survey indicate that organizational politics constitute either a serious challenge that holds them back or something that requires special effort to overcome. This tricky political environment is likely to have a significant impact on the future of the CDO role as it overlaps with a number of existing roles in the organization. The CDO role is often one of accelerating and bringing coherence to the various digital initiatives already in place in the organization. The role concerns the employee experience, although this is viewed as secondary by some organizations in comparison with the customer experience. Time will tell if this grows into a recognized, value-adding function, or if it remains a time-limited mission of bringing about the digital transformation of the organization.